OK, the Four Plant Pots is a bit of a literary device, but you catch my drift! The wedding of which I speak is that of Blanche and Chris. Blanche invited a group of Burwell Bashers to join in the celebrations and to provide some musical diversion in the evening. Isn't this the loveliest photograph? Those of us who are more used to seeing Blanche at Burwell wearing cropped jeans, tee-shirt and trainers were a little gobsmacked to find out just how well she scrubbed up! 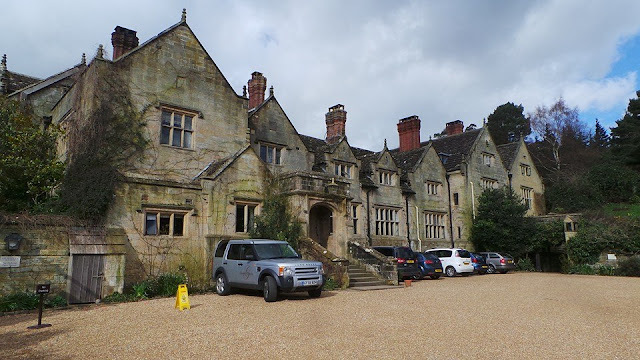 The wedding was held at Gravetye Manor Hotel, in West Sussex, a 16th Century manor house standing in wonderful grounds - do google and have a look, the gardens are quite famous. 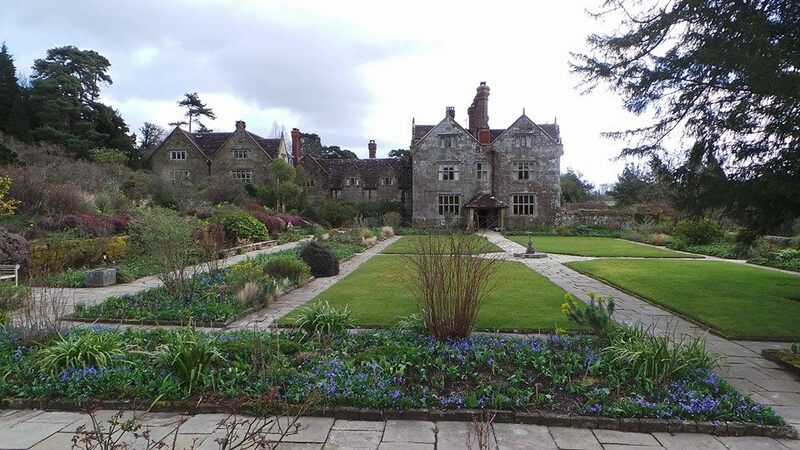 Just one part of the gardens, in front of the original 'front' of the house. I WISH I had managed to zoom in for this, but didn't really have time. Jayne played Blanche in with that lovely old Irish tune "Give Me Your Hand". So beautiful. Blanche and Chris cutting the cake. Is that a beautiful wedding dress or what? SO elegant! Ah, now this is me, having just had a master class from Melanie Morris (BurwellBasher) on how to smile for the camera - something which I have never been able to do; I end up looking like I am either grimacing or saying something off-colour out of the side of my mouth! Not sure there is much improvement to be honest! My old friend Sam Pirt - how lovely to meet up again with him - he and Blanche are long-time good friends. It was such a treat to share a platform with him, what an accomplished player he is. Well, here we are, fitted and working and now part of the cottage; I'm getting used to a very different manner of cooking from the Rayburn, but loving having a gas hob again. The griddle is a brilliant piece of kit. Cooks marvellously, drains off the fat and even fries eggs with no more fat added. We love it! April view of the rock garden - I'll have to do something about those muscari - I love them but they are just one big tangle now in the old sink. I've re-done the alpines so it looks a bit bare in there at the moment. Overnight, another chook took up residence, so that is one happy rooster we've got here now! The chard which was evacuated from the square foot garden has resurfaced and not doing too badly - I've had quite a few leaves off the white chard plants; the rainbows need a while to recover. 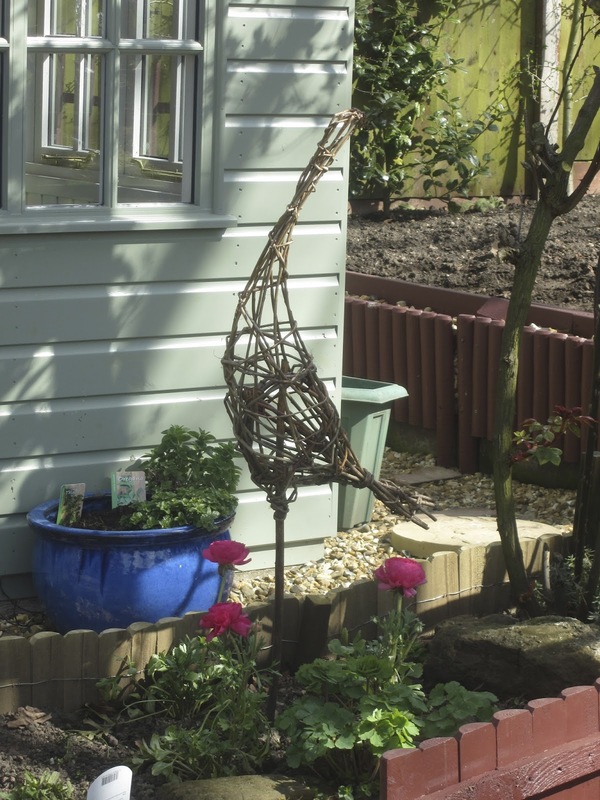 The Willow Bird found its final placement and is enjoying the pink ranunculus - how I love these flowers! I've got a load of corms planted up for next year. This purple collection is largely waiting for final resting places. I have wild violets coming up all over the garden and I'm trying to transfer them to where I want them, when the top half of the garden plan is up and running. (More of which another time) The French Lavenders will stop in the buckets for now, but I'm planning on having a collection of lavenders - there is a place which sells herbs over towards Dereham which we want to go and visit, I can buy a variety from them. So, for a chap who was vehemently against raised beds… Jim bought me the square foot garden if you remember for Christmas 2014 and it never really did much. Now I have sown two types of chard, two types of beetroot, and spring onions, with space in the centre for something else. He also built the brick raised bed for me, which has red veined sorrel you can just see, and under the fleece spinach, radish (two differently timed sowings) and rocket, with bulb fennel going in next month. AND he has just shown me a surprise in the garage (no, not the woodshed!) - another raised bed all waiting to be safely treated AND he says there is enough wood for another smaller one, so that entire space will be raised beds! And I never even asked! So with other plans up our sleeves for the rest of the garden things are looking quite exciting - and I say that as someone who has never raised a trowel in anger in her life! Just to re-establish my credentials as a stitcher, here is the latest crochet offering, a slightly more muted version of my Caravan Granny Blanket - which has actually gone to the caravan! This will fit in better with the existing ripple and granny/treble blankets in the living room. Just a few more rows, sew in the ends and maybe add a border… what do you think? The original inspiration for this blanket was of course Lucy, at Attic24 blog. 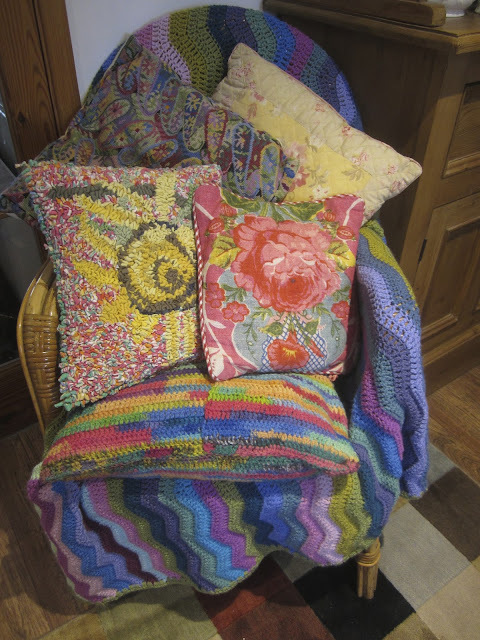 And, just because, a photo of my favourite chair, next to the dresser, covered in colourful blanket and cushions of all persuasions! This collection cheers me up every time I glance at it. So, there we are, a few plant pots and a lovely wedding. There are loads more wedding photographs but I've already shared them on Facebook so wasn't feeling like trotting them all out again. I hope you are enjoying some of this lovely spring sunshine - in-between the showers and high winds! Catch you next time! Hi Catriona, thanks for visiting and leaving such a lovely comment! I can knit, but find crochet more relaxing these days. 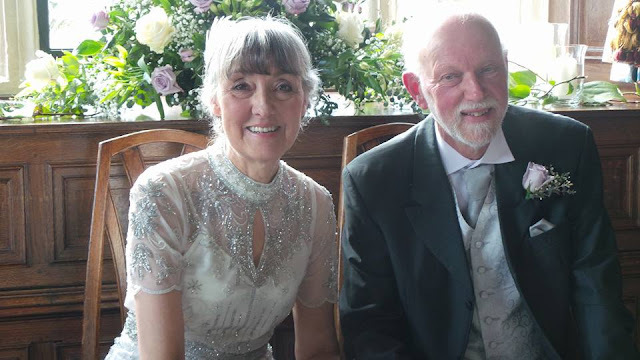 So lovely to see these wedding photos - Bride and Groom both look elegant. And yes, Lynne, that is a lovely photo of you after your master class in smiling = very good. I love the herb place near Dereham but it's down a small lane on the way out of Dereham but well worth going to. We went last year and I wanted some lemon thyme to plant around flower borders to try and deter cats. They didn't have much out but when I asked they went and got some from their back for me. They are really helpful and sell special compost for growing herbs as well. Hi Lynne, I live in Norwich and have followed your blog for quite a while. I love the textile work that you do. I do crochet, knitting and sewing, and reading about herbs. I so want to learn more about them and I am doing an online course but haven't got very far yet. sorry to take so long to reply but the course is a Diploma in Herbalism which I purchased for £29 through Groupon from Online Academies. This tells you a bit about it. UTOR TALK: This course covers herbal medicine, aromatherapy and flower essences - all therapies that use plants in some way or another. At the end of this course you will understand and hopefully will have learned a lot about the herbalist theories associated with plants. You will not be qualified to stock your own herbs or to sell to the public but you will be able to treat any client using tinctures and herbal remedies that have been purchased from manufacturers and also to keep your own family and friends healthy, with home grown herbs. You will also be able to make up externally used herbal remedies like poultices for any client. You will also understand the theory of aromatherapy but alas not the practical massage. Flower essences do not require such a practical course and are harmless yet potent medicines for many ailments especially emotional, mental and spiritual. Hope this helps and yes, it would be good to meet up some time. Hello Lynne, I so enjoyed my visit . . . so much to take in and I loved every minute of it. The wedding looked like something from a fairy tale . 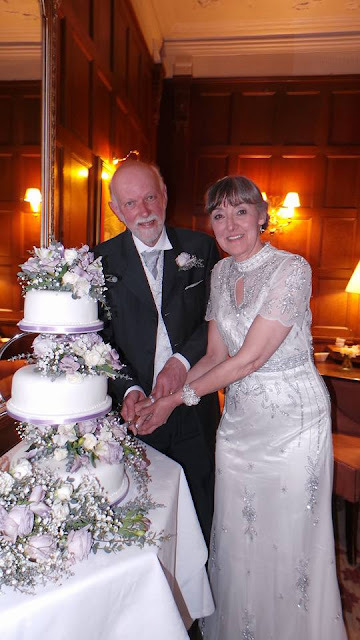 . . the building with ivy covered walls and the bride was beautiful in her gorgeous dress, then there's the cake . . . a piece of art, if I do say so. Love your new cooker. I wish they made them like that in the US. Then there is your garden and your colorful blanket . . . well, like I said, I loved every minute of my visit . . . beautiful and so cheery. Don't you just love Spring? I wish that I lived closer; I would love to hear you play. Lovely bride and the dress was amazing. Loving the crochet blanket those colors are right up my alley. Nothing like a gas stove for cooking and baking...I bet you have wanted to cook more on this one! Love the tin chooks, where did they hatch?! And the crochet is such pretty colours, Stylecraft I presume - I think I recognise the colours. I never cooked with a gas hob until coming here to Norfolk, now I can't imagine going back to an electric one, so much more responsive. Greetings! I just found your blog; it's delightful! I was wondering about the yellow flowered cushion; Is that a sunflower? How was it done? I can't quite decide if it's crewel or something else. I'm working on fixing an old quilt for my daughter, (She's 34 and lives 1200 miles away), When that's done, if i don't die first!, i really want to get back into cross stitch and crewel and that pillow is just beautiful! Loved the bride! (And groom..) She's lovely, isn't she?? I erased my blog; i bored myself silly. No sense boring other people, too! Thanks for the tip about Dobbies! And I'd be interested to know if the lemon thyme that Pat hoped would deter cats from flower borders actually worked. Much as I love cats, and one who visits the garden, they are a nuisance pooing wherever they please, and we've tried all sorts to deter them from sonic things that send out a noise which they don't like - our visitors must be deaf! - to plants that are supposed to deter - but our visitors have no sense of smell either it seems. Love your smiley face but I always thought you had a charming smile anyway! Aww, shucks! (blushes) Not sure ANYTHING deters cats from the garden actually! Catching them out with a bucket of cold water might help! I hate it when they start screaming at each other! Lovely post of a special occasion. Blanche's dress is just perfect for her. I love it. Your little estate is thriving and shows great prospects. I knew a really old gardener who used to position bottles of water around his veg plot and garden and they deterred the cats. Once the plants grow a bit they hide the bottles lying or standing around and you can occasionally use them then refill them if needed. Have a great weekend and I hope the sun shines where you are. Lovely pic of you so you must give a lesson on how to smile for photos! I need it too as there is an old woman in the mirror in front of me every time I look.